Learn to ascertain a richer picture of each of your customers by developing a comprehensive data strategy – how can you drive loyalty in your business? Measure customer behaviors across multiple devices to build an accurate reflection of consumer activity, media consumption, path-to-purchase and more. This week alone, attendees confirmed include Expedia, Singapore Airlines, Turkish Airlines, Trip Advisor, IHG, Cliff Hotels, IHG and more who will be joining our confirmed speaker list including Hilton, Marriott, Choice Hotels, Winding Tree, Priceline, Booking.com, Cathay Pacific Airways, Lola, Air Canada and more! Hyatt, TripAdvisor, Fairmont, Hilton, Expedia, Japan Airlines, Marriott, Winding Tree and more will come together on April 9 -10 at EyeforTravel’s San Francisco Digital Summit 2018 . The summit, just under two months away, will tackle topics such as the role of emerging technologies in travel, personalization, marketing strategies, utilizing data and technology to deliver an exceptional customer experience & much more. And this is just the start. This week, we have confirmed attendees from Hyatt, TripAdvisor, Fairmont, and Hilton San Francisco who will be joining our confirmed speaker list including Expedia, Marriott, Choice Hotels, Winding Tree, Priceline, Booking.com, Cathay Pacific Airways, Lola, Air Canada and more! Blockchain Demystified: How Can It Be Applied in Travel and How Will It Change Your Business? This summit is truly the only place you will be able to meet the cream of the crop in travel, walk away with insights you can action as soon as you get back to the office. The EyeforTravel San Francisco Digital Summit 2018 (April 9-10 Hotel Nikko), just over two months away will tackle the role of emerging technologies in travel, and help travel brands benchmark their digital strategy from some of the best in the industry. The event is perfectly positioned to address the all-important question currently on the minds of travel brands' now: What technologies should they invest in to enhance their digital strategy and how? The summit will provide the perfect platform to ascertain the real tech strategy from the hype, to truly come to grips with the opportunities of these technologies for digital marketing campaigns; and to successfully engage and get closer to the customer. - Blockchain Demystified: How Can It Be Applied in Travel and How Will It Change Your Business? Here is a snapshot of experts taking the stage in San Francisco in 2017! Will Farnan, Client Partner – Travel Suppliers, Facebook and more! Drive Data Excellence: Leverage data to get up close and personal with your customer at Smart Travel Data Summit Miami 2018! With more searches, on multiple platforms, while passengers are on the move gives travel brands endless amounts of data that they can use to their advantage to improve the customer journey. EyeforTravel has put together a summit - Smart Travel Data Summit in lovely Miami (27-28 Feb) which is an intimate networking and discussion based event that unites leading players from the travel market- from the hotels, airlines, online marketing, data integrators, software developers, revenue managers, tech innovators and more to examine the steps needed to develop and deploy a strong business model, to create market traction and engage the connected traveler in a data heavy world. If you work in travel and focus on data analytics, revenue management, marketing or product development, this is the event for you to attend to walk away with actionable insights. They have topics from Wyndham and Expedia covering personalization, AirBnb talking about the next steps in machine learning, to McKinsey, Southwest Airlines and Delta Airlines talking about new frontiers in revenue management for airlines, Winding Tree talking about Blockchain as the next Major Disruptor and a lot more on GDPR and customer experience! They don’t just stop there, with 100+ people data experts that will attend to discuss the need for chatbots, data strategies, marketing analytics and artificial intelligence best practice, customer behavior, machine learning and more to make sure you have all the takeaways you need in just 2 days. With just 23 passes to go, now’s your chance – click here to join the travel data elite! Today’s customers can book a hotel, a surf lesson and flights on their phones, laptops, tablets and even over voice command! Travel brands really need to focus on the channel preferences for each customer to ensure sales and services are tailored to keep customers coming back! EyeforTravel have brought together key experts to discuss what to do next in this live interactive webinar – sign up to listen in on 21st Feb 3pm GMT. So, what's the game changer? EyeforTravel think technology and data, with smartphones at the helm. So, today's travel brands are leveraging AI, Mobile Integration, NFC, geolocation, beacons and more in an all-out pursuit of customer happiness and seamless travel. With tech savvy passengers’ eager to use new digital services to transform their journeys, they can offer a new ecosystem of connected personalized services wins. To share industry insights, EyeforTravel have partnered with TIBCO to create a live webinar series that covers the technology and data that is transforming travel operations. You can sign up to listen in or request the recording here. Sounds like something you need to be thinking about for 2018 then sign up here to join the session at 3PM GMT (10AM EST) on 21st Feb 2018. If you can't make the time - sign up anyway and we will get sent the recording! 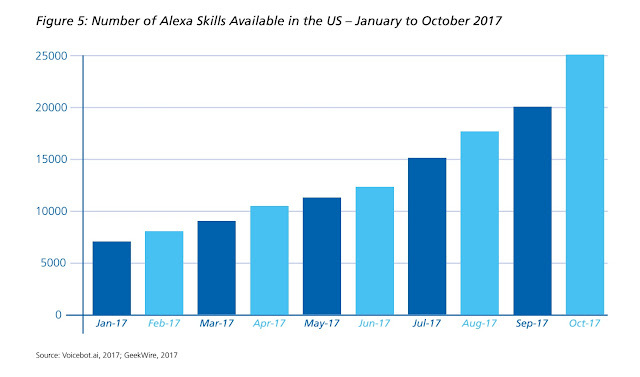 Travel brands have only just started putting in voice-first services and currently Amazon has a clear first-mover advantage thanks to its Alexa and Echo products says EyeforTravel’s new free report. Are Amazon, Apple, Google and Microsoft falling behind Chinese voice tech? 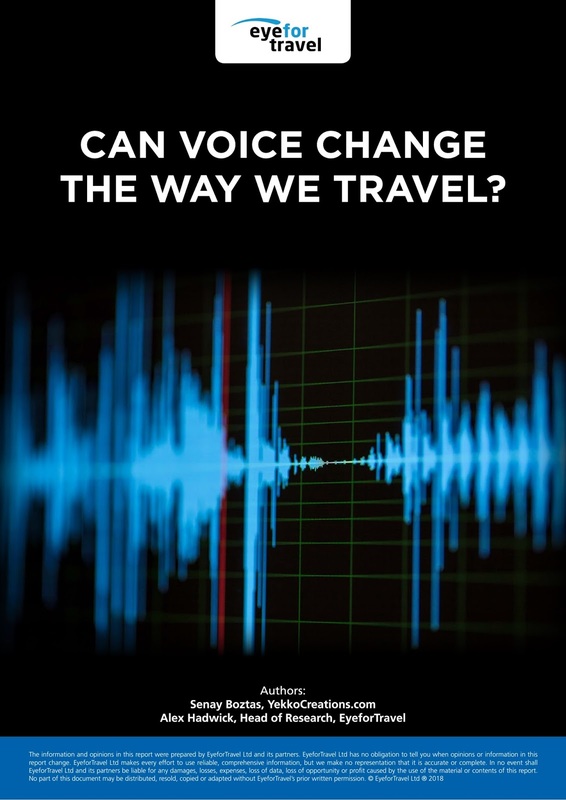 China is a crucible for the spread of voice technologies and domestic companies might be leading the world currently in this field says EyeforTravel’s new free report into voice. Unique dynamics make China a perfect laboratory for developing and deploying voice technologies. This is propelling local players, principally Baidu and iFlytek, to become world leaders finds EyeforTravel’s new Can Voice Change the Way We Travel? report. China is likely to become the key market for voice technologies and one in which travel brands need to be paying attention due to a number of reasons. Firstly, is the Chinese language, which has thousands of individual characters rather than a conventional alphabet. This makes typing a challenge, particularly on the smaller screen of a smartphone, creating a clear need that voice can solve. Furthermore, Chinese travellers are far more mobile focused than travellers in other markets according to EyeforTravel’s Chinese Travel Consumer report. Progress in voice technologies means that voice technology is already the most convenient way for Mandarin speakers to operate their smartphones. A joint Baidu, Stanford University and University of Washington study from 2016 found it was three times quicker to say English words than type, and 2.8 times faster with Mandarin, while the rate of mistakes was a fifth lower using English and almost two-thirds lower with Mandarin. This creates the demand for voice to flourish in the Chinese market, but local players have further advantages of a supportive Chinese government that has made AI a core focus and a more amenable regulatory environment for this field of research. Data that can be collected, analyzed and deployed with far fewer legal data security and privacy restrictions than in the EU or the US. This could be key, as the quantity of data is key in this kind of machine learning, especially as engineers tackle the next challenge of getting AI to understand and respond to speech in a contextual framework. That data is already being generated by millions of Chinese consumers. Whilst Apple claims Siri has a userbase of around 375 million, likely making it the most used personal assistant outside of China, China’s leading player at the moment iFLYTEK claims more than 700 million end users, which they believe gives them more than 70% of the Chinese voice market. Media reports more widely quote a figure of around 500 million regular users, still a vast figure. Crucially, both companies have also been able to establish an ecosystem of various players who depend on their software, unlike Apple and Siri. This enables them to extend the reach of their rising voice empires and gather more data to further improve accuracy. Both companies claim that thousands of companies have already developed products from their voice technologies. So, the big tech players in the West have plenty to feel anxious about given the progress of their Chinese counterparts and the scene is only going to get more crowded as Samsung started to push its Bixby voice products in the second half of 2017. Therefore, if there is one key market that travel brands need to keep an eye on in relation to vice technology developments, it is China. The already deep penetration of advanced technologies, alongside unique market dynamics and a language particularly well suited to voice applications seems likely to make the country the forefront for this new way of engaging with the digital world.